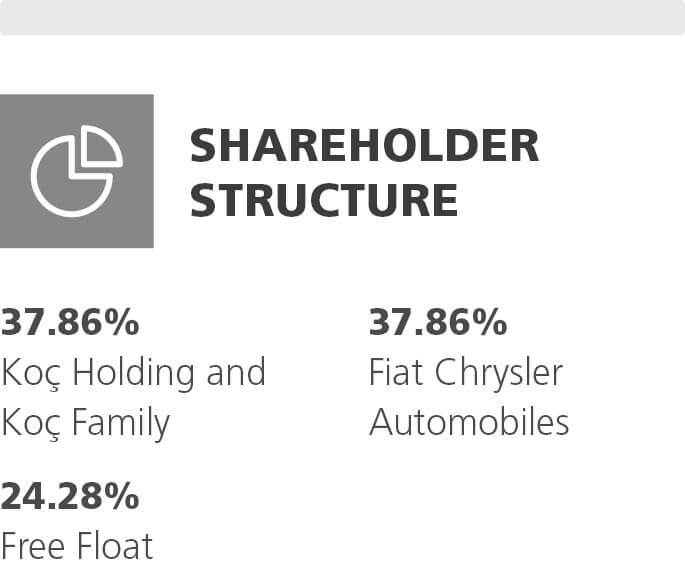 Tofaş has the second largest R&D capacity of Fiat Chrysler Automobiles in Europe. Tofaş is the only domestic automotive manufacturer in Turkey that produces both passenger vehicles and light commercial vehicles. 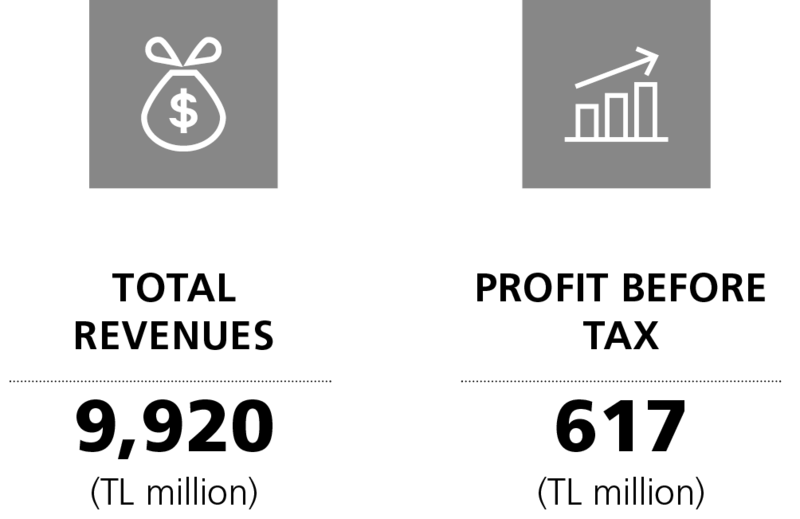 Product investments – which started with the Doblo America and Doblo Innovation projects and continued with the Egea family in 2015 – are scheduled to continue in 2016 with the 356 HB, SW and Fiorino face-lift investments. 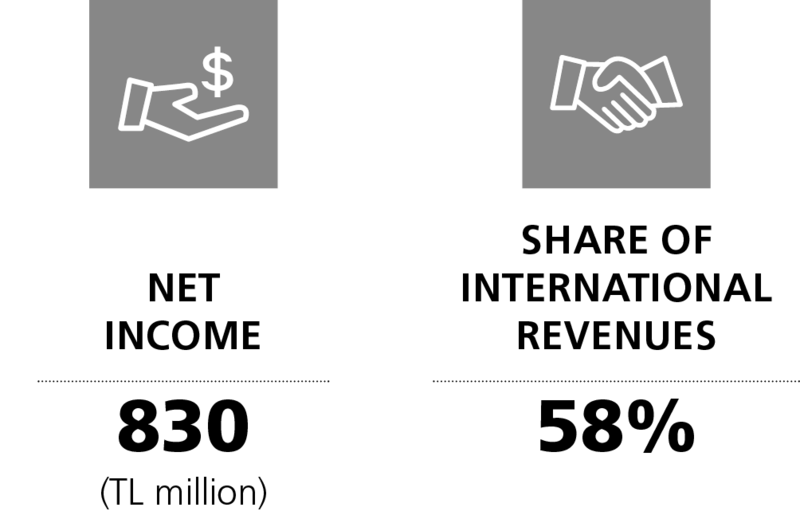 Together, these product investments will total USD 1.5 billion. 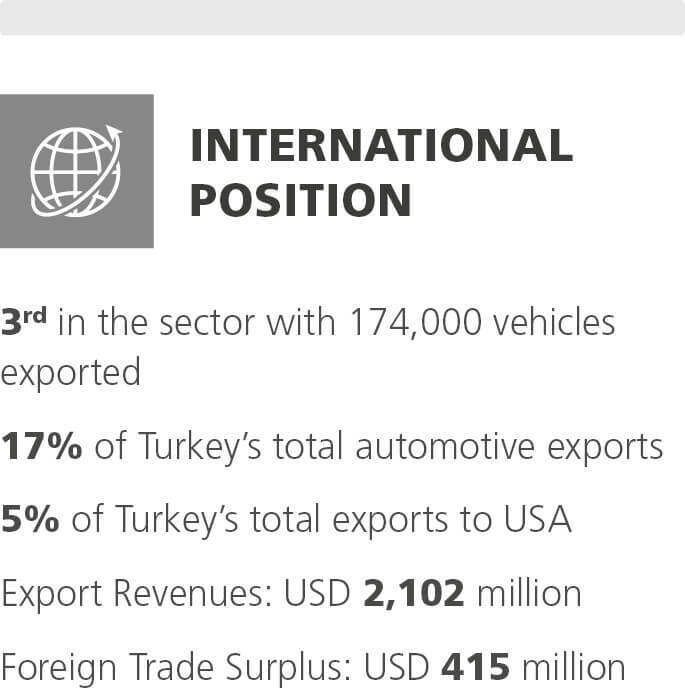 During the year, the Turkish automotive market sold more than 1 million vehicles and set a historical record. Manufacturing and exports also reached all-time highs of 1 million 359 thousand vehicles, and 992 thousand vehicles, respectively. Some 73 out of every 100 vehicles produced were exported. 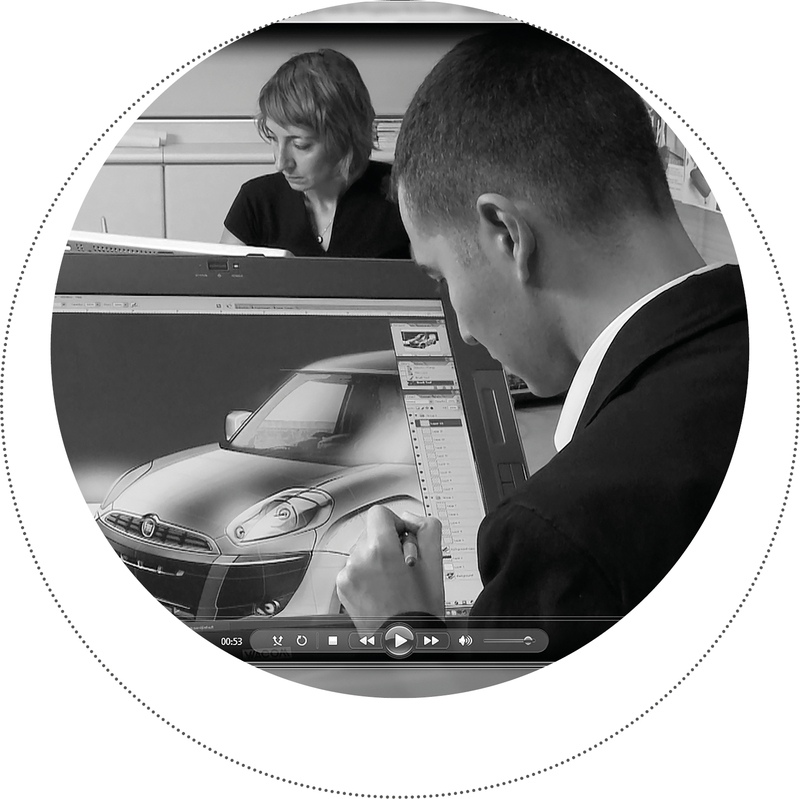 The industry ranked 16th in global automotive production. 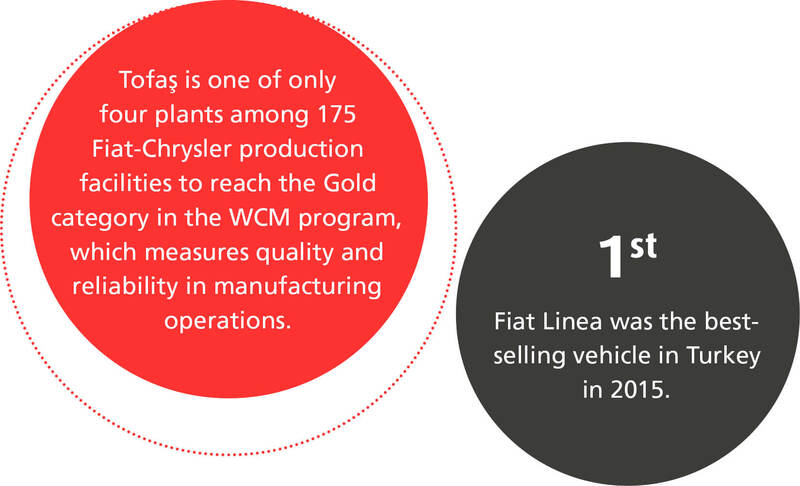 Additionally, it ranked first in commercial vehicle manufacturing and seventh in automobile production in Europe. Tofaş brands reached a total market share of 11.8% in the Turkish passenger car and light commercial vehicle market. 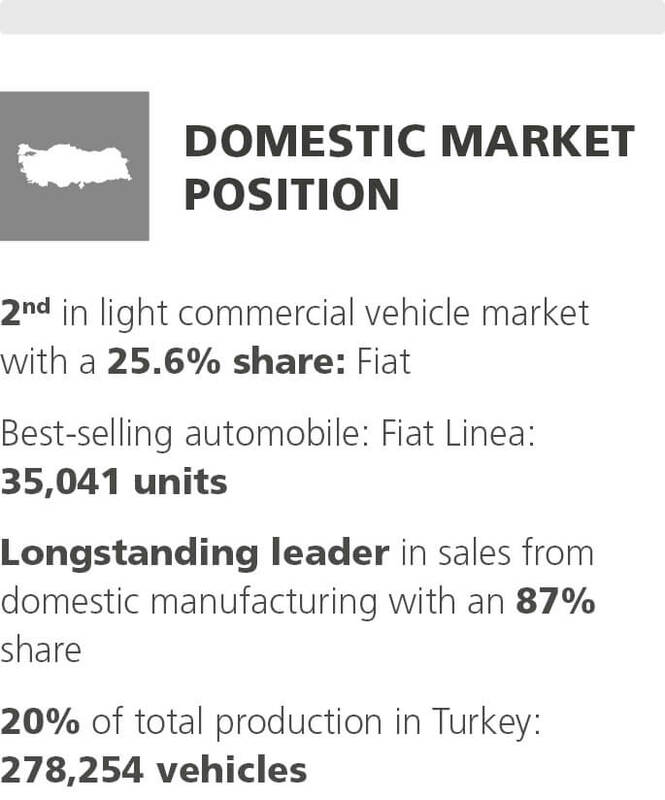 Tofaş is the 2nd of the domestic light commercial vehicle market with its Fiat brand, reaching a market share of 25.6%. Meanwhile, the Company is fourth in the overall passenger car and light commercial vehicle market, with an 11.3% market share and 109,490 unit sales. In 2015, the Company rolled out the fourth generation Fiat Doblo, Fiat 500, Fiat 500X in the SUV segment and the new compact sedan Egea models. Launched in November, Egea became the third best-selling sedan model in December and started being marketed in EMEA export markets under the Tipo brand. The Jeep brand, present in the Turkish market for 22 years, hit its highest sales figures ever, with 3,499 Jeep vehicles sold in 2015, up 79% from 2014. Autobest named Fiat Egea the "Automobile of the Year in Europe." At the ODD Sales and Communication Awards 2015 Gladiators, Fiat Egea garnered the "Special Jury Award of the Year." Fiat Linea became Turkey's top selling vehicle. Fiat Doblo's Ram-branded version ProMaster City – exported to the USA – was designated "Green Commercial Vehicle of the Year 2016" by "Green Car Journal." At the UK's "Commercial Vehicle Fleet Awards," Fiat Doblo Cargo was named the "Small Van of the Year" while Fiorino Cargo received the "City Van of the Year" designation. At the R&D Centers Summit, Tofaş was presented with the "Best R&D Center" award in the automotive sector, the "Third Best R&D Center" award among all R&D centers, and the top prize for "R&D Spending Intensity" and "Project Capacity." In the "EU R&D Scoreboard 2015" rankings, Tofaş was the highest scoring Turkish company. At the "2015 Sustainable Business Awards," Tofaş was named the best performing company in the "Carbon and Energy Management" category. The Company's Corporate Governance rating went up from 9.01 to 9.06. Tofaş plans to continue new model investments and product launches in 2016. The Company aims to deliver the fully automatic, gasoline version of Egea to customers starting in February. Tofaş will commence manufacturing the 356 HB and the face-lifted Fiorino in the first half of the year and the 356 SW in the second half of the year. Together with the new models in 2016, the Company's exports of the 356 family are projected to reach 100 thousand units. New product investments are expected to add momentum to Tofaş's manufacturing and export drive, while the added employment and export potential will make a positive contribution to the Turkish economy. Koç Fiat Kredi provides consumer financing for the brands sold via Tofaş. The Company provided loans of TL 1,895 million for 63 thousand vehicles in 2015, thereby financing 70% of Tofaş's retail sales. Its loan portfolio totaled TL 1,922 million. Koç Fiat Kredi financed its lending by issuing securities with a total nominal value of TL 327.4 million, of which TL 112.4 million was obtained by security issuance.